This is a 1996 book by J.I. Packer and, as one might expect, is written from a wealth of insight and wisdom. The first chapter, “God’s Freedom Trail,” is an excellent application of authority in the believer’s life. 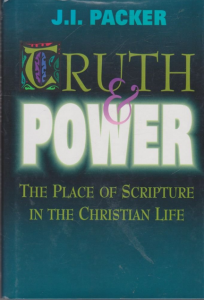 Packer says, “The truth, paradoxical yet inescapable, is this: there is no freedom apart from external authority.” He then does a masterful job of applying that to God and Scripture. The remainder of the book builds upon the first chapter and is a defense of biblical inerrancy, a view that Packer has always held. This is a timely subject for our day and Packer retraces the steps of this century as the Bible was attacked and redefined to the place that it has lost its authority to many who call themselves evangelical. This may also be a timely book for Packer himself because it allows him to restate his position on the Bible in the wake of his unseemly defense of the ECT document. Except for an odd statement regarding abortion (the Bible forbids us seeing “the fetus as anything less than a person heading for a viable life” p. 32), this book is a good review of the inerrancy controversy.